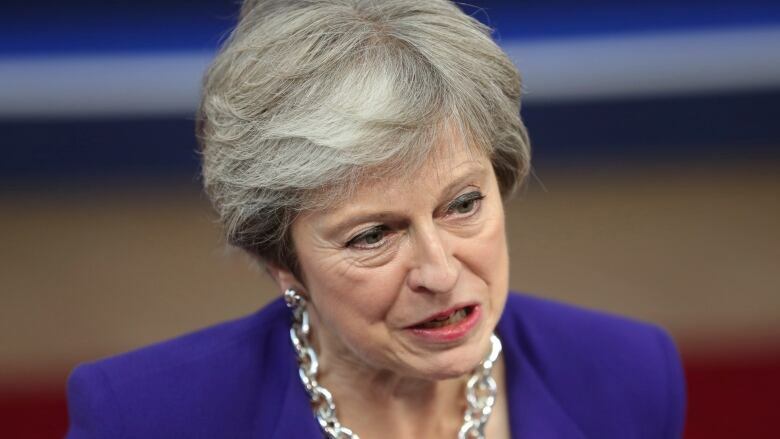 British Prime Minister Theresa May signals she would consider extending a so-called transition period "for a matter of months" after Britain leaves the European Union, a move her critics say is a betrayal of Brexit. Suggestion comes amid stalled talks with EU, criticism in U.K.
British Prime Minister Theresa May signalled on Thursday she would consider extending a so-called transition period "for a matter of months" after Britain leaves the European Union, a move her critics say is a betrayal of Brexit. May said the remaining differences on Brexit terms between the U.K. and the EU are "few but considerable" — but she says she's confident the two sides will reach an agreement. EU leaders are wrapping up a summit long billed as a deadline for a Brexit bill. But with talks on the vexing issue of the Irish border deadlocked, both sides said they needed several more weeks or months to work on an agreement. Britain is due to leave the bloc on March 29, 2019, so there is not much time to strike a deal and get it approved by relevant parliaments before the deadline. "A further idea that has emerged, and it is an idea at this stage, is to create an option to extend the implementation period for a matter of months, and it would only be a matter months," May told reporters on the second day of an EU summit in Brussels. "But the point is this is not expected to be used because we are working to ensure that we have that future relationship in place by the end of December 2020." May tried to use the summit in Brussels — once seen as the stage for a possible breakthrough after more than a year of talks — to offer a softer tone to her EU counterparts after another such meeting last month ended in acrimony. "It's one of the possible options. It's neither a firm proposal from the EU 27 nor a formal request from the UK," the Elysee Palace official said. "It's something we shouldn't rule out. If we were to go in that direction, it would come with a certain number of conditions." British Cabinet Office Minister David Lidington said it was too early to estimate the cost of extending a Brexit transition period. Lidington rejected claims that an extension would cost Britain more than £10 billion (more than $17 billion) in payments to the European Union in order to stay in the bloc's single market and customs union for another year. "You are making an assumption about what the insurance policy would include and the insurance policy actually being applied," he told the BBC on Thursday. "It is precisely one of those things that needs to be teased out and addressed, whether we felt and the EU felt it was the right approach to take." Lidington said any extension was likely to last for a few months. And the suggestion that Britain could stay firmly in the EU's sphere for longer than the 21 months expected has fired up those who already say Britain has already given up too much in the negotiations. Others fear May is leading the country into a no-deal Brexit. "She is losing the confidence of colleagues of all shades of opinion. People who have been supportive of her throughout this process, they are close to despair at the state of this negotiation," said Conservative lawmaker Nick Boles, a critic of May who during the referendum backed remaining in the EU and now wants to stay in the single market on an interim basis. "It really is a desperate last move." For many who campaigned to leave the EU, the idea of continuing to pay into the bloc well beyond Britain leaves in March next year is anathema. "We cannot find the money to fund our front-line police properly, we cannot find the £2 billion [more than $3.4 billion] for the vulnerable on Universal Credit, but we can mysteriously find billions to bung to the EU for the unnecessary extra year," Conservative lawmaker Nadine Dorries said. "This is serious." But the EU is sanguine about an extension. After talks stalled over the weekend, one of the bloc's negotiators told diplomats that Brussels had proposed extending the transition by a year to make its proposal for an Irish backstop — already ruled out by Britain — more palatable. The idea, diplomats said, was being "tentatively explored."